For example, to teach respect for a woman's body, Islam stresses chastity -- but places the primary burden for chastity on men, not women. While clerics and priests today declare that women should "get married" or "dress more modestly" to avoid domestic violence, Prophet Muhammad held a different view. While encouraging marriage and modest dress for both genders, Prophet Muhammad significantly and as a foundation commanded men, "You be chaste yourselves, and women will be chaste." He commanded men to stop obsessing over how women behave and dress, and instead demanded men focus on self-reform and self-improvement. While the Qur'an admonishes women to dress modestly in the footsteps of Mary Mother of Jesus, it instead and first commands men to "cast down your eyes" and "not stare at women lustfully" -- no matter how a woman chooses to dress. A woman is responsible to herself and God to dress and act modestly, while a man is primarily obligated to women, to himself, and to God to treat women with respect and not gawk. Most notably, Islam's solution to stop violence against women is not a religious answer -- it is a secular answer. It obliges men to safeguard their chastity, treat women with equality, take ownership over their own behavior, and respect a woman's body and right to self-determination. Violence against women will stop when men stop committing violence against women. I would like nothing more than my pro bono practice in domestic violence to become obsolete. But as long as we rationalize data to support the preconceived notion that woman are the root cause -- or a cause -- of violence against women, I'll unfortunately have more clients than I can handle. For the sake of humanity, stop blaming women. 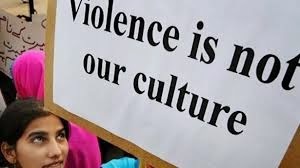 In the meantime, I'll raise my two young sons with Prophet Muhammad's example -- that the key to stopping violence against women rests with civilized men and their personal ownership.